The 5 Definitive Steps to Build Your Brand. Personal branding is the most powerful marketing strategy for achieving success. Whether you are a job professional or a business trying to succeed, You Need Branding. Learn about the 5 Most Definitive Steps to Brand Yourself. Engage Murali to Take Your Brand From Invisible to WOW! Identify your purpose and vision. What are your strengths, what value do you bring to the table? Announce Your UVP – Unique Value Proposition to the world. In the form of a Tagline or Brand Statement. Make sure it is visible everywhere, your business card, email signature, your elevator speech, and more. Today, you need to combine traditional methods with a strong online presence. So next, develop a Strong Brand Online. Update your LinkedIn, Facebook, Instagram pages, your online summary and more. Remember, don’t just go online. Optimize your presence with strong keywords. Third – Join Industry Groups, Offline and Online, Network Extensively, Volunteer Selflessly. Create awareness for yourself and your brand by being out there… Shaking hands and developing referrals. Nobody wants to hire… or work with someone who is just a face in the crowd. Don’t just blend in. Stand out by always projecting yourself as an Industry Leader. Write a Blog, develop projects, promote them, give off yourself. You are the face of your brand, keep delivering value. And it will come back strongly. Lastly, keep delivering great brand experiences. People don’t hire candidates, they invest in great talent. People don’t buy products or services, they crave brand experiences. This is the reason $4 Coffees and $1000 smart phones exist. Keep up to date with trends, keep learning, get certified if needed, keep sharpening your edge. Think of your brand as a living organism, you need to water it daily. So, there you are! 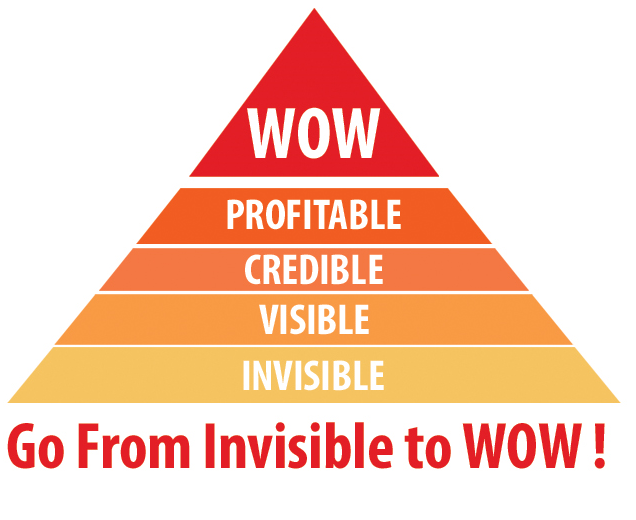 The 5 Most Definitive Steps to Build Your Brand – to Go From Invisible to WOW! Ready to take your Brand from Invisible to WOW? Get in touch with Murali today. Feel free to get in touch with me regarding Building Your Personal Brand or Branding Your Business. Murali Murthy © 2018 All Rights Reserved.